Description: DL C425 #2452 in fresh EL paint before lettering was allplied at S.Scranton, Pa. shop. Description: DL C425 #2452 on Pocono Mt. Chapter Cresto excursion at Tobyhanna, Pa. Description: I took this right after our NRHS Convention Special pulled into Steamtown for its grand reopening in 1995, which coincided, of course, with the NRHS Convention. We had ALCO diesels on the way in, of course, but Milwaukee Road 261 on the way out!! Description: Another one that's been around the block... Was EL 2452, ended up on BC Rail as 802 until eventually coming home to D-L. Description: DL 2452 once an EL unit wears its EL paint scheme. Description: DL 2452 at the D&H Yard in Scranton. Description: quite a few ALCo parts around here. . Description: one more view, gotta love the ALCos! Description: Looks more like an Erie Lackawanna executive train than a Steamtown excursion. Description: After a day of assisting CN 3254 on the Water Gap excursion, DL 2461 and 2452 idle at Bridge 60. Description: D-L crew assembles NYGL passenger extra in Steamtown Yard. 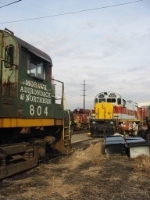 Description: A pair of C425s switch a small cut of cars in the Scranton Yard. This train will head East on the Pocono Main after crossing over to the other side of the yard.